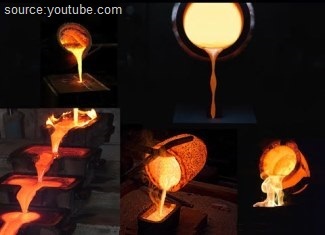 Casting is also known as foundering, is the oldest manufacturing process in which liquid molten metal is poured into a perforated casting cavity of refractory material. Allow liquid metal to solidify, after solidification the casting metal can be taken out by breaking the mold. The casting process is used to produce components such as pistons, mill rolls, wheels, cylinder blocks, liners, machine tool beds. Different terminology used in casting process are molding sand, baking sand, facing sand, loam sand, parting sand, CO2 sand, flak, pattern, parting line, sprue, runner, ingate, riser, chill, and chaplets. Molding sand is the refractory material used for making the mold. It is a mixture of silica, clay, and moisture to get required properties. Facing sand is the carbonaceous material sprinkled on the inner surfaces of the molding cavity for obtaining better surface finish. Green or dry sand with at least 50% clay and dries hard is called loam sand. It also contains fire clay. It has 18 to 20% moisture and produces a good surface finish. For separating the molds from adhering to each other by separating a fine sharp dry sand called parting sand. It also can be used to keep green sand from sticking to the pattern. It is the clean clay free silica sand. In the sand-in-place of clay sodium silicate (Na2SiO3) is used, called as Carbon dioxide (CO2) sand. When the CO2 is supplied into this sand, it the CO2 will chemically react with sodium. Flak is the molding box used for holding the sand. Based on the situation it can be named as cope, drag, cheek, etc. Lower molding flask is called drag. Upper molding flask is called cope. The middle molding flask used in the three-piece pattern is called cheek. The pattern is the replica of the casting to be produced. The parting line is the dividing line between the two flasks. Sprue is the connecting passage between the pouring basin and runner. It controls the flow of molten metal. The runner is the passage used for regulating the flow of molten liquid. Ingate is the last point of gating from where the molten metal enters the cavity. The riser is the reservoir of molten metal provided in the casting process to compensate the liquid shrinkage’s taking place during solidification. Chill is the metallic piece used for obtaining directional solidification. Chaplets are used for supporting the cores inside the mold cavity to take care of its weight and mold cavity to take care of its weight and overcome the buoyancy forces. Molten metal flows into small ant section in the molten cavity. Hence any complex shape can be easily produced. Practically any material can be casted. Due to small cooling rate from all directions, the properties of casting are same in all directions. Any size of casting can be produced up to 200 tons. Casting is the often cheapest and most direct way of producing a shape with certain desired mechanical properties. Certain metals and alloys such as highly creep resistant metal-based alloys for gas turbines cannot be worked mechanically and can be cast only. Heavy equipment like machine leads, ship’s propeller, etc. can be thrown easily in the required size rather than fabricating them by joining several small pieces. Casting is best suited for composite components requiring different properties in various direction. These are made by incorporating preferable inserts in a casting. For example, aluminum conductors into slots in iron armature for electric motors, wear resistant skins onto shock resistant components. With normal sand casting process, the dimensional accuracies and surface finish is less. Sand casting is labor intensive.